Got the Matte black iPhone 7 Plus. Feels great in hand. New Home-button powered by a Taptic engine feels great. 12MP wide-angle + telephoto cameras on the back produce excellent shots. Comes with new Portrait mode which creates a beautiful depth-of-field effect that keeps faces sharp while creating a blurred background. Get heated badly while charging and gaming. I own an iPhone 7 plus 128 GB(Matte Black). Writing this review after using it for few months. Its very smooth and fast. No lagging issue unlike all android phone I have used till date. Excellent Battery life. I love the camera which has the portrait (depth effect) mode. The stereo speaker is also pretty good. Initially I was using iPhone 6 so for me plus size was big but when I started using it I really loved it and now I feel a phone should be atleast of this size. It&apos;s amazing to use this phone, there are so many things one can do in this phone which makes it so different than any other phones. The camera is the best thing I love about the phone. The new quality of dust and water proof of this phone is worth everything. You have to be too protective of this phone because after investing so much one wouldn&apos;t want a dent on the phone also and it gets dents and marks easily also with the glass which breaks easily and then it&apos;s too expensive to put a new one. Its a nice phone phone, brand I regularly use. So used to it. Fantastic storage and slim phone! 67 Pricebaba users have written their experience with Apple iPhone 7 Plus 128GB. If you own Apple iPhone 7 Plus 128GB, please do leave your feedback too. Lowest price of Apple iPhone 7 Plus 128GB price in India starts at Rs. 59,490 Apple iPhone 7 Plus 128GB is available on Flipkart at Rs. 59,490. Prices updated on 20th April 2019. Starting iPhone 6 Apple is know to launch 2 new models at the end of Q3 every year. In 2016, the iPhone 7 and the iPhone 7 Plus were launched, where the 7 Plus is the elder variant to have a bigger and better screen with Dual Camera Setup on the rear. The design of the iPhone 7 Plus has received a slight change from its predecessor as it now boasts of a dual camera setup. And we have the same metal unibody this time with water repellent coating and added two new color variants the Jet Black and Black to its existing Gold, Rose Gold, Silver variants where the Space Gray is now replaced by Black. The displays stay the same of the Apple iPhone 7 and the Apple iPhone 7 Plus from their respective predecessor, but are 25% brighter and now also sports Wide Color Gamut. iPhone 7 Plus has a 5.5 inch display with a resolution of 1920x1080 pixels and a pixel density of 401PPI. The iPhone 7 Plus comes with 3GB of RAM. It also has dual firing Stereo Speakers and no 3.5mm headphone jack and instead comes bundled with Apple EarPods with lighting connector with an adapter in case you wish to use your old headphones with a 3.5mm pin. Also the new home button now is no more mechanical but Tactic Engine enabled Force Touch like the one found on the Apple Macbook with support for third party apps. Apple iPhone 7 Plus has received a major camera bump with Dual Rear Cameras with it's 56mm telephoto lens that enabled 2x Optical zoom along with another standard 28mm lens and also has OIS support. For the first time Apple has shifted the base version to 32GB from the standard 16GB version with 128GB and 256GB options, all storage options doubled. As always there is no storage expansion slot on an iPhone. Apple iPhone 7 Plus has a bigger battery unit of 2900mAh, thanks to the bigger form factor. In terms of connectivity we get all the necessary sensors with 5GHz Wi-Fi support, NFC, Global 4G LTE with VoLTE support and WiFi calling. 1. Will this phone support Reliance Jio network? Ans: Yes, Apple iPhone 7 Plus 128GB supports VoLTE and hence will works well with Reliance Jio network. Ans: Apple iPhone 7 Plus 128GB uses Apple's proprietary lightning port for charging. 3. Does it have a 3.5mm standard headphone jack? Ans: No, the Apple iPhone 7 Plus 128GB lacks a dedicated 3.5mm standard headphone jack. The Earpods supplied with the phone have a lightning port and cannot be used while charging. You may still use your earphones with 3.5mm pin, thanks to the converter supplied with the phone. 4. Will this get further software updates of iOS? Ans: Yes, Apple is very well known for providing iOS updates for older iPhones. Based on the past stats, Apple is seen pushing software updates to devices as old as 4 years. Ans: Yes, this phone has excellent performance and can handle any task or game easily. 6. 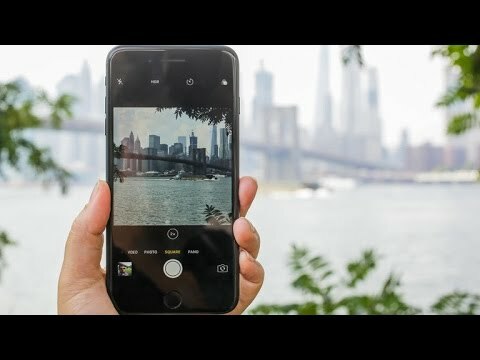 Does the phone support 4K video recording? Can it also record slo-mo videos? Ans: Apple iPhone 7 Plus 128GB was the first phone receive a 12MP camera with 4K video recording support. And yes, you can also record Slo-mo videos with the phone's rear camera. 7. Is this phone waterproof? Ans: Yes, the iPhone 7 and the iPhone 7 Plus feature IP67 water & dust resistance. 8. What comes in the box? Ans: The box of the Apple iPhone 7 Plus 128GB consists of the device itself, wall charger, a lightning cable for charging and data syncing, a pair of in ear Earpods, lightning to 3.5mm converter and a SIM ejector pin.